Water Jet Machining (WJM) also called as water jet cutting, is a non-traditional machining process in which high velocity jet of water is used to remove materials from the surface of the workpiece. WJM can be used to cut softer materials like plastic, rubber or wood. In order to cut harder materials like metals or granite, an abrasive material is mixed in the water. 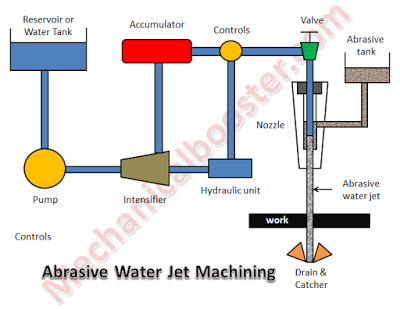 When an abrasive material is used in water for the machining process, than it is called as Abrasive Water Jet Machining (AWJM). 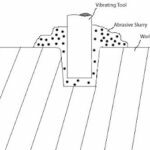 The most commonly used abrasive particles in AWJM are garnet and aluminum oxide. 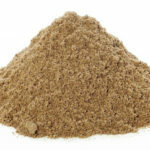 Sand (Si02) and glass bead is also used as abrasive. 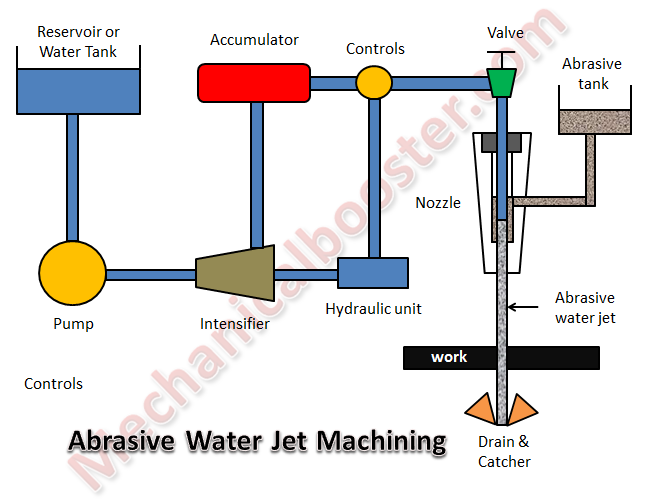 The function of abrasive particle is to enhance the cutting ability of water jet. It is used to circulate the water from the storage tank during the machining process. The pump delivers water to the intensifier at low pressure of about 5 bars. A booster is also used which increase the initial pressure of water to 11 bar before delivering it to the intensifier. It is used to increase the pressure of water to a very high pressure. It receives the water from the pump at 4 bar and increases its pressure up to 3000 to 4000 bar. It stores the high pressurized water temporary. It supplies that fluid when a large amount of pressure energy is required. It eliminates pressure fluctuation conditions in the machining process. It is a vacuum chamber where the mixing of abrasive particles into water takes place. It controls the pressure and direction of the water jet. 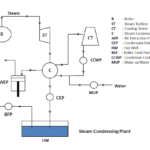 The flow of the water is regulated with the help of flow regulator. It is device which is used to convert pressure energy of water into kinetic energy in water jet machining. Here nozzle converts the pressure of water jet into high velocity beam of water jet. The tip of the nozzle is made of ruby or diamond to prevent it from erosion. After the machining, the debris and machined particles from the water is separated out with the help of drain and catcher system. It removes the metal particle and other unwanted particles from the water and sends it back to the reservoir for further use. Difference Between Up Milling and Down Milling – Which is Better? The water from the reservoir is pumped to the intensifier with the help of a pump. The intensifier increases the pressure of the water from 5 bars to 3000 to 4000 bar. This high pressure water from the intensifier is moved to the nozzle as wells as in accumulator. The accumulator stores the high pressure water and supplies it at any instant when it is required. It is used to eliminate the fluctuation of high pressure requirement of machining hard material. The high pressure water is than passed to the nozzle where the high pressure energy of the water is converted into kinetic energy. A very high velocity jet of water (1000 m/s) comes out through the nozzle in the form of narrow beam. abrasive such as garnet or aluminum oxide is mixed with water within the nozzle. A mixing chamber is there in the nozzle where the abrasives get mixed with the high pressure water. This high velocity jet of water when strikes the surface of the w/p removes the material from it. The water jet after machining is gets collected by the drain and catcher system. Here the debris, metal particles from the water is removed and it is supplied to the reservoir tank. The working will same for the water jet machining but abrasive particles is not mixed with the high velocity jet. only pure water jet comes out from the outlet of the nozzle. It has the ability to cut materials without disturbing its original structure. And this happens so because there is not heat affected zone (HAZ). 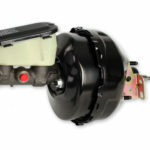 It is capable of producing complex and intricate cuts in materials. The work area of in this machining process remains clean and dust free. 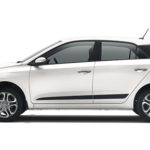 It has low operating and maintenance cost because it has no moving parts. The thermal damage to the workpiece is negligible due to no heat generation. It is capable of cutting softer materials (WJM) like rubber, plastics or wood as well as harder material (AWJM) like granite. It is environment friendly as it does not create any pollution or toxic products. It has greater precision of machining. The tolerances of order of ± 0.005 inch can be achieved easily. It is used to cut softer materials. But AWJM can cut harder material of limited thickness. Very thick material cannot be machined by this process. Initial cost of WJM is high. Water jet machining is used in various industries like mining, automotive and aerospace for performing cutting, shaping and reaming operations. The materials which are commonly machined by water jet (WJM or AWJM) are rubber, textiles, plastics, foam, leather, composites, tile, stone glass, food, metals paper and much more. WJM is mostly used to cut soft and easy to machine materials such as thin sheets and foils, wood, non-ferrous metallic alloys, textiles, honeycomb, plastics, polymers, leathers, frozen etc. 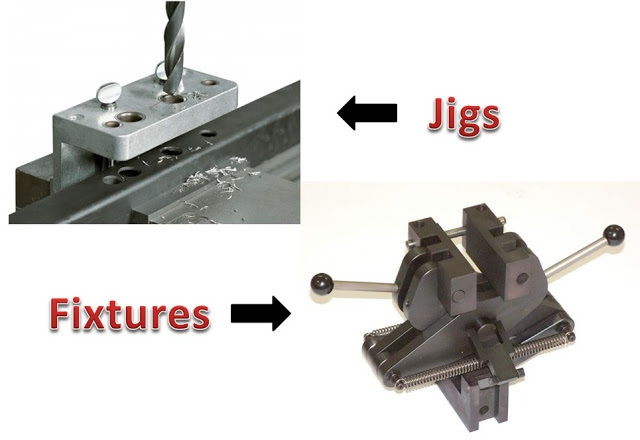 AWJM is typically used to machine those materials which are hard and difficult to machine. It is used to machine thick plates of steel, Al and other commercial materials, reinforced plastics, metal matrix and ceramic matrix composites, layered composites, stones, glass etc. Beside Machining process the high pressure water jet is used in paint removal, surgery, cleaning, peening to remove residual stress etc. 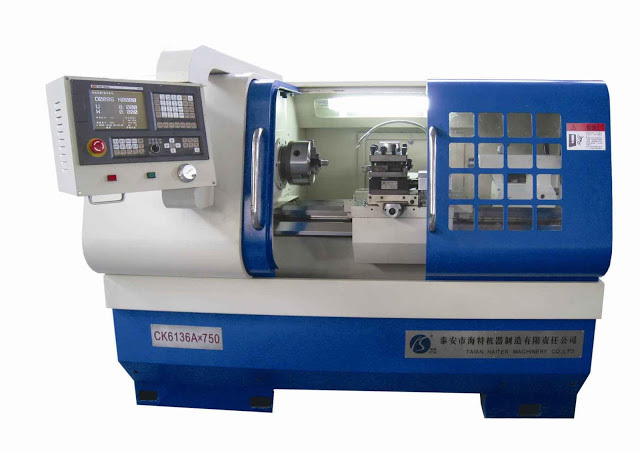 AWJM can also be used to perform drilling, pocket milling, turning and reaming. 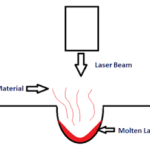 What is Heat Treatment Process? It very good post about mechanical knowledge practically.